‘Til the Band Comes In is a transitional album. 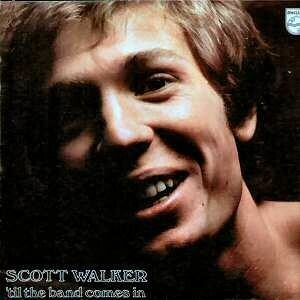 Unfortunately, it finds Scott Walker transitioning from the artistic triumph of Scott 4 and his other earlier solo efforts to the crass commercialism of his mid-1970s output. Despite its unevenness, the best material is among the man’s very finest and too good to pass up. It all starts fine enough. “Prologue” opens the album with sweeping strings that work quite effectively drawing in listeners. “Little Things (That Keep Us Together)” is propelled with an odd meter (5/4). Walker’s delivery of “Joe” bears an astonishing resemblance to Jack Jones. Then “Thanks for Chicago Mr. James” arrives, building slowly with prescient glockenspiel chimes toward peaks that rush past in a dramatic fashion few but Scott Walker could muster. It is the pinnacle of the album. That is both the good news and the bad news. While the album has its strengths, its flaws start to become apparent when Esther Ofarim rather than Walker sings the next song “Long About Now”. It’s not that her performance is poor, but that she doesn’t have the same nuance and presence — she’s a bit like a stuffy, quavering version of Karen Carpenter, perhaps even comparable to Vashti Bunyan or the young Marianne Faithfull. The guest vocal is doubly unfortunate because Walker’s voice was really in its finest form entering the early seventies, so any lost opportunity to hear him seems like a small tragedy. As the album progresses, something else becomes apparent. The songwriting isn’t always there. The lyrics can be too blunt and the musical concepts sometimes feel like they revisit areas Walker has already explored, but with less compelling results this time around. The overly affected “Time Operator” and the forced, trite “Cowbells Shakin” come to mind as the low points. They are broken up by the bawdy cabaret number “Jean the Machine”, which, though a novelty song, does keep the pace moving (and that’s not to mention that it expresses sympathy for a “commie spy” during the Cold War). The album does pick up a bit in the title track and the stirring “War Is Over (Epilogue)”, the latter having a shimmering grandiosity worthy of pause. The cover “Stormy” is most definitely passable, though the last part of the album, post-epilogue, comes across as filler. Wally Stott arranged most of the album, but Peter Knight arranged the last third — all covers. Most of this album is fine, fine music. Scott Walker does achieve something here. Yet somewhere along the line, something slips from his fingers. In some ways it’s a sign of the times, as the deepest material perfectly reflects a sense of nervous, incomplete satisfaction with the changing world, echoing the way Hunter S. Thompson wrote about the end of the Sixties, looking west with the right kind of eyes and almost seeing the high-water mark where the wave finally broke and rolled back. But ‘Til the Band Comes In can feel like something neglected or unfinished, propped up at times. It is as if a desperate conservative streak overcomes Walker as a specter of spiritual and physical weariness arises. Rather than articulating the state of the world through his eyes he’s just caught up in the menial aspects of getting by. His immediate path forward would be downhill. This would be his last album to feature his own songwriting for some years. Of course, hindsight has shown that he came back as strong as ever later on.